After the tsunami and earthquake that happened in Japan recently, people all around the world have been stepping in to help the country or just by sending out messages of concern. SNSD was no different as they recently released a message on their mobile fansite. We would like to express our deepest sympathy to the victims of the Tohoku Pacific Ocean Earthquake. We came to know about the news of the earthquake in Thailand. Regarding SNSD who has activities in Japan, this isn’t somebody elses problem and all of the members are concerned. Even now, the aftershocks, tsunami and disasters continuously occur and there is serious damage. This current condition pains our hearts very much. We pray from our hearts that everybody will peacefully get over this hardship. Fan Cams from the Korean Music Wave in Bangkok! It was probably a very exciting and amazing events for all the fans that attended..so many big name stars were there that night 🙂 Here are the fan cams from the event! Check it out and let me just say, YulTi + Nickhun as MCs= Love. After their trip to Bangkok to perform at the Korean Music Wave, the girls were spotted back in Korea! Talk about a mighty quick trip, hope it’s not too tiring! We haven’t seen a Domino’s Pizza commercial in awhile, but fear not a new one has just been released! Fresh, bright colors to represent the upcoming warm weather? It’s certainly a happy and cheerful CF! Not all the girls are present (well not until the end at least!) but the Mah bad. Out of it. The cuteness is still on overload though! Is it just me or does that pizza look WAYYYY better that the pizza we have in the US? Or maybe that’s just the Soshi effect..
SONEs are surely one of the most dedicated, passionate, talented fan bases out there (not to toot my own horn :P). I mean just watch the following video of SoshiVN doing a flash mob for Visual Dream. Just a super short, to-the-point post 🙂 SNSD’s back in Korea so just a few pictures of some of ’em snapped at the airport. Plus a lovely picture from Spao. And lastly a rumor on YongSeo’s spot on We Got Married..dun dun dun. Because I love that picture so much..
Apart from a highly anticipated release of Mr. Taxi, the girls will also be having their first nationwide tour in Japan this coming May! It’ll be called “the 1st Japan Arena Tour” taking place in 4 different cities, with a total of 7 concerts. It kicks off on the 18th of May, starting in Tokyo then Osaka, Nagoya, and finally Fukuoka! Edit: More info about Mr. Taxi added at the bottom! 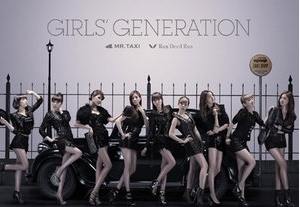 Looks like the rumors concerning Soshi’s 3rd Japanese single is for real…because here’s the cover art! It’s called Mr. Taxi and rumor has it, it’s the CM song for Lipton Tea (credits to Yurui912!twitter)! CF Shi Dae much?! 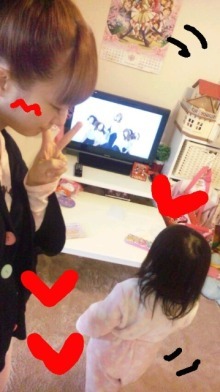 Two new pictures have surfaced on the internet of an adorable little girl watching the Japanese Gee PV..who could it be?